My first weapon purchase and I used it for my conceal carry class, my instructor was very impress because it is easy to handle. A Gun shop owner recommended it because I was a first time user. I love this gun. I have tried several other brands and have come to like this better than all the rest for my CC gun! Very comfortable to hold and no problems whatsoever. I really like this pistol ! I smooth up the action and install truglo night sight. The pistol is extremely accurate and reliable for a reasonably priced conceal carry gun. For the price (sub-$400), this is a very nicely German-made 9mm. The grips are comfortable, even for cement hands like mine, the re-coil is indeed manageable, and after the first 100 rounds there were no mis-fires using re-loaded ammo. The take down took some getting used to...at one point I thought I might have broken it, but once you figure it out, the light bulb goes on in the head and it becomes a non-issue. My critique would be that the sights are not very visible in low light conditions, such as my range. At the current time, literally no one makes aftermarket night sights for the CCP. Improved sights or night sights would definitely be a plus, but that being said for a 3.5" barrel quality piece under $400, it would be hard to judge Walther too nicely.It shoots consistent groupings, and once you get used to the sights you like it even more. Nice reliable little gun, trigger pull gets better with use. While it is very comfortable in the hand, I find I shoot the PPS better. 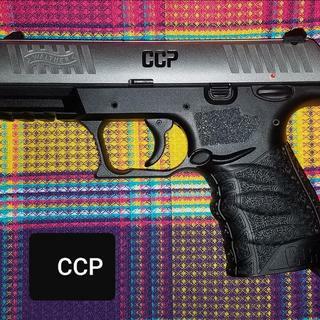 The PPS is a more stout design, if your pushing this caliber. The CCP throws the cases a long ways. Have ordered 10+ firearms from grabagun. Fast shipping on handguns, after a couple of days getting the order together. Long guns or accessories tend to slow things down by several more days. Packaging is basic but secure, though padding is up to the original manufacturer; and an upper/lower S&W purchase were blems by the time they got to me.The Walther CCP failed in under 50 rounds. The factory reloads were hot, had one rear case rupter in a glock 19, and VP9. Glock had to be hand cycled for the next round, then functioned w/o issue, the VP9 didn't care (no misfire). The walther PPQ had no issues with this ammo.The CCP slide was jammed back 1/3, eventually it did free, the safety was blown out of the grip. The safety would not return to the grip after field stripping, and the slide jammed halfway into place upon reassembly. Their is a piece of metal protruding out the bottom side of the slide (spring?) that does not appear to belong their, where the firing pin, spring, and disassembly mechanism are. The manual has no skeletonised drawing to determine what the firing pin mechanism should look like; but judging by how it jammed upon reassembly, something broke their as well.